ALBANY, NY (WSKG) – The new state budget, due April 1, will be first one decided by an all-Democratic state legislature in a decade, after Republicans ruled the Senate for most of the past century. And while the leadership of the Senate and Assembly have been newly reasserting their governing powers, when it comes to the spending plan, there’s only so far that they can go in their disagreements with Gov. Andrew Cuomo. The Speaker of the State Assembly, Carl Heastie, and the Senate Leader, Andrea Stewart-Cousins, have in just a few short months, formed a close working relationship. They often hold joint events together, where they announce agreement on major pieces of legislation. Before a press conference on March 19, announcing an agreement on installing speed cameras at schools in New York City and Buffalo they engaged in friendly banter about who had the most party members with them in front of the podium. “You win the member count today,” Stewart Cousins, told Heastie. “We probably always will,” Heastie quipped in reply. In the first 10 weeks of the session, they’ve acted to strengthen abortion rights and transgender rights, allowed children of undocumented immigrants to receive college aid, and passed gun control measures. In many cases, Gov. Cuomo, who also backed those measures, has struggled to keep up, his role reduced to signing the bills afterwards. 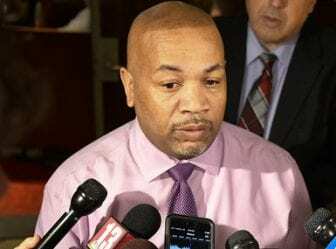 Heastie, who is so pleased about the changes that he referred to himself and the Senate Leader as the “wonder twins” in a story in the New York Times, said there is a new way of doing business in Albany. For the first eight years that Cuomo was governor there was a divided government with Republicans leading the state Senate. Friction between the newly unified legislature and Cuomo has come out in the open during the budget process. Cuomo has been disparaging toward the Democrats, saying the Assembly is too beholden to the teachers unions, and that the Senate Democrats are too inexperienced to make good governing decisions. “Now you have to govern as opposed to just doing a bumper sticker political slogan,” Cuomo said on March 12th on WAMC. Speaker Heastie said the comments are unnecessary. “Disparaging comments aren’t helpful,” Heastie said. Stewart-Cousins said she spoke to the governor about her displeasure with his statements. Since then the governor has not repeated his comments. But the Democrats in the legislature may find their ability to move ahead on bills without the governor curbed when it comes to the state budget. Once the budget goes beyond April 1 without a deal, the governor can present a spending extender — and add all of the policy items he likes in it, for example his version of items like legalizing adult recreational marijuana. The legislature has just two choices — pass it, with no amendments, or reject it, and the government will shut down. Cuomo has said if that happens, the legislature will take the blame. The governor’s ability to present a take it or leave it budget stems from a decision by the state’s highest court. It was brought by the then Speaker of the Assembly, Sheldon Silver, against former Gov. George Pataki. The court sided with Pataki, and said a governor can put unrelated policy items into the budget, and the legislature has no power to alter them. Speaker Heastie, who is Silver’s successor said he’s fully aware of that. “Once you go past the March 31 deadline, it increase the governor’s power,” he said. Another potential incentive is the future of a pay raise for lawmakers. A commission granted them their first salary increase in 20 years, but said it was contingent on the budget being passed on time. Lawmakers say that rule, which is being challenged in court, does not affect their decisions.